2017 has been particularly kind to the University of Wisconsin softball team. Even though the season is only six games in, the Badgers have already managed to accomplish something no other Wisconsin team has done in their 22 years of program history: start a season 6-0. The Badgers have kicked off 2017 undefeated through a six-game winning streak, which included two victories last Thursday in Tampa against the University of South Florida Bulls and the Binghamton University Bearcats. Coming off their impressive showing at the Uni-Dome Classic in Cedar Falls, Iowa, last weekend, Wisconsin (6-0) continued their success by knocking off the No. 20 Bulls (3-2) in the first game of a double-header. With the help of another stellar pitching performance by freshman Kaitlyn Menz and some timely hitting in extra innings, the Badgers were able to fend off USF with a score of 3-1 after the game went into extras tied at zero. Menz, who improved to 4-0 on the season, showed poise early by working out of three jams. These jams featured two baserunners with two outs in the first three innings while Wisconsin could not get rolling at the plate. The pitcher’s duel continued all the way into the eighth inning. After a fielder’s choice forced out the lead runner at home, Sara Novak came up to the plate with the bases loaded and one out. Novak then sent a pitch up the middle for a two-RBI hit, giving the Badgers a 2-0 lead. Wisconsin was able to tack on one more run on a sac bunt by Brooke Wyderski. Menz surrendered one unearned run in the bottom frame, but did not budge getting a double play and a ground out to end the game — giving the Badgers their second extra-innings win and first over a ranked team this season. The following game against Binghamton (0-1) had the looks of another close match, but Wisconsin’s offense came alive in the final two innings, producing seven runs and forcing the mercy rule in a 9-1 victory. Kirsten Stevens got the start for the second game and kept the trend of solid pitching going, striking out 10 and scattering four hits and one run over the course of six innings. 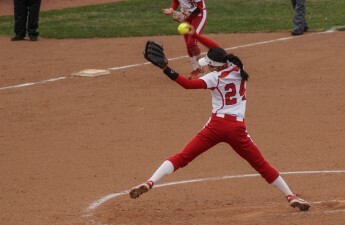 Despite only collecting two hits, the Badgers held a 2-1 lead heading into the bottom of the fifth when the game became one-sided with the help of some fielding blunders by Binghamton. Wisconsin had Kelsey Jenkins on first with two outs when Chloe Miller singled with an error by the left fielder advancing both runners one base, setting the stage for Wyderski. The junior knocked in both runners with a base hit to center, giving the Badgers a 4-1 lead. Novak added another run with a single, extending her hit streak to six games. Wisconsin put the nail in the coffin the following inning, courtesy of a three-run homer by Stephanie Lombardo, increasing the score to 8-1. A Jenkin RBI single made the score 9-1, which triggered the mercy rule and secured the win for the Badgers. The Badgers winning ways continued thanks to contributions from the offense and pitching. Wisconsin has outscored their opponents 35-10 while their top two pitchers, Menz and Stevens, combine for a record of 6-0 and average a .45 ERA. Following the wins, Wisconsin left for Clearwater, Florida, to compete in the Michele Smith Pediatric Cancer Foundation Invitational. UW improved to 7-0 against St. Joseph’s University Hawks, lost their first match of the season to No. 14 James Madison University Dukes (3-1), but rebounded to take down the Hofstra University Pride. Wisconsin took on St. Joseph’s in the first game of a double header on Saturday and were able to extend their best start in program history to a record of 7-0. The first runs of the game came in the third innings when good baserunning by Brianna Flugaur. The junior pinch ran for Stephanie Lombardo after a leadoff single, stole second, advanced to third on an error and eventually game home to score on a wild pitch. Later that inning, Brooke Wyderski doubled home Chloe Miller making the score 2-0. Angela Morrow got the start and delivered a quality start part 3.1 innings allowing two earned runs. The Hawks came back to tie the game in the fourth courtesy of a Sarah Ostazewski homer and evened the score at two after a Raelynn Genovese RBI double. In the bottom half of the frame, it was Wisconsin’s turn to answer. Heather Rudnicki pinch ran for Melanie Cross after Cross doubled down the left field line. A sacrifice bunt sent Rudnicki to third who then came home to regain the lead on a fielder’s choice making the score 3-2. Mariah Watts held the Hawks scoreless for the rest of the game giving the Badgers the win. Scheduled to play immediately after, Wisconsin’s game against James Madison went through a lengthy rain delay. The Dukes got to Kaitlyn Menz early scoring three runs in the first with three RBI singles and tacked on another run in the fourth inning increasing the deficit to 4-0. Menz pitched the complete game with four earned runs. The Badgers could not find an answer for James Madison pitcher, Megan Good. In danger of being victims of a perfect game, Wisconsin did not collect their first baserunner until the top of the sixth when Flugaur reached on an infield single to third with two outs. The next morning, the Badgers took the field against Hofstra. This time around, Wisconsin’s bats were the ones making noise early. Miller got the Badgers on the board with an RBI single and Wyderski added the exclamation point for the inning with a three-run homer making the scored 4-0. In the bottom of the third, leading 4-1, Wyderski delivered again this time with a two-run home run. Wyderksi finished with five RBIs in the game. 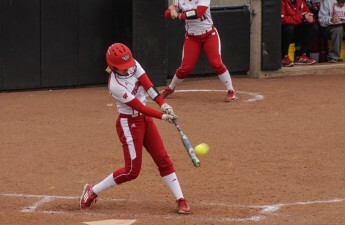 Another run in the fourth inning gave Wisconsin a 7-1 advantage. Hofstra began chipping away at the lead in the sixth inning with a two out bases clearing double that made the score 7-4. The Pride loaded the bases up again in the top of the seventh. Watts got a groundout to first for the second out which brought home another run making the score 7-5. 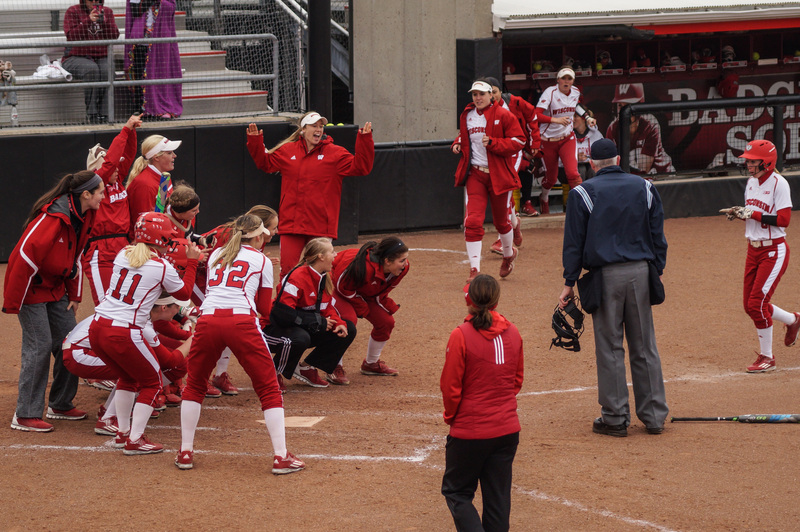 With the tying run on second base, Watts ended the game with another groundout giving Wisconsin the win. Wisconsin now continues their tour in Florida heading to Fort Meyers for the Sheraton Invitational from Feb. 24 to Feb. 26. 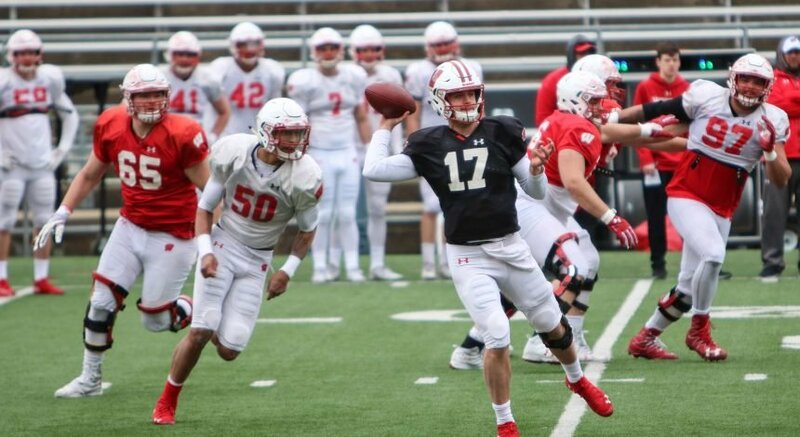 The Badgers will play five games facing the Florida International University Panthers, the Boston College Eagles, the Florida Gulf Coast University Eagles, the Hofstra University Pride and the Rutgers University Scarlet Knights.